A gastric balloon is a device that aims to help you lose weight by reducing feelings of hunger and helping you feel fuller for longer after eating only small amounts. Placement of the balloon is a non-invasive endoscopic procedure for adults with a body mass index (BMI) between 30 and 40, who have tried other weight loss programs, such as following a supervised diet, exercise and behavior modification program. The course of treatment with the balloon is six months, after which the balloon is removed. At Virginia Mason in Seattle, this procedure is part of a comprehensive weight loss center that focuses on developing long-term, sustainable, healthy habits to lose weight and keep it off. The multidisciplinary experts within the Nutrition Center of Excellence are here to guide you through every step of your weight loss journey. To learn more about this procedure or schedule an appointment, please call (206) 223-2319. 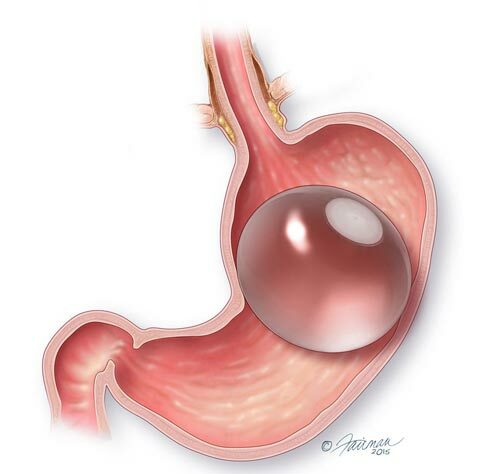 During the gastric balloon procedure, a soft balloon (about the size of a grapefruit) is inserted into your stomach through your mouth, using an endoscope (a thin, flexible telescope). The balloon is then filled with saline to partially fill the stomach, allowing you to more easily control your portion sizes. You will be sedated during the procedure, which takes about 20 to 30 minutes. Most patients are able to go home the same day. At six months, the balloon is removed and your Virginia Mason support team will continue to guide you toward making healthy lifestyle choices in your nutrition and activity. The program they design for you will be essential to help you overcome the challenges of achieving your weight loss goals. What are possible side effects of the gastric balloon? The most common side effect of the placement of the gastric balloon in the stomach is the onset of nausea or vomiting. For some patients, this can last one to two weeks. What is the recovery process for a gastric balloon placement? After placement of the gastric balloon, you may experience some gastric discomfort, nausea or vomiting for a few days as your digestive system adjusts to the presence of the balloon. Medication is prescribed to help manage these symptoms. You will be restricted to a liquid diet for three days after the procedure, during which you should drink plenty of water. After the first few days, you can transition to semi-solid foods (thicker soups and fruit purees), then gradually to solid foods. The length of time for this transition depends on how your body is adjusting. What if I have other questions or concerns about gastric balloons? Our staff and nurses are available Monday through Friday from 8:30 a.m. to 4:30 p.m. by calling (206) 223-2319. What other non-invasive, endoscopic options for weight loss are available? In AspireAssist, a small tube inserted into your stomach connects to a low-profile button on the surface of your skin, through which some of your stomach contents are emptied after eating.